Which Boots for a Hot Climate? Home > Ask Our Experts > Which Boots for a Hot Climate? Normally I work onboard a science vessel in the Atlantic/Pacific Ocean but I have been offered a position for a year within a game reserve in South Africa. Boats, ships and shoes I know about but african terrain...nope not a thing...so ask the experts! I have read your website top to bottom but would still like to ask your advice. Do I go for heavy and durable or lighter weight? I have no foot problems whatsoever and would like to keep it that way so any advice you could offer would be most appreciated. Many thanks in advance for your assistance. Obviously, your experience on the ground is going to be very different from your previous job, and you’ll go through the seasons in a more direct way. Summers will be hot, and winters, if not as cold as Britain, can still be a little chilly and mean different conditions. Because of that, it’s impossible to recommend just one pair of boots to cover the entire year. 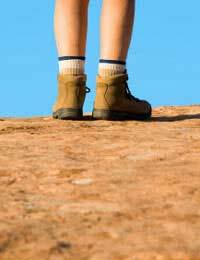 For the warmer weather, light boots should be adequate, although you should make sure they’re boots, not hiking shoes, simply for the extra ankle protection, especially if you’re going to be doing plenty of walking. For the summer months you can probably manage without the boots being waterproof, but make sure there’s a good, firm tread on the soles to get a better grip on dusty soil. It should go without saying that you’ll also need several pairs of good hiking socks. Those with a fine mesh lining, that guarantee no blisters, work well in all weathers, although experiment with other types, too. They should fit well and feel comfortable in all boots. But what about the winter? That’s when heavier boots will work well for you. They don’t need to be heavyweight, but ample to cope with harsher, wetter conditions, so waterproof boots will be a great advantage. These days it’s easy to find a whole range of makes and models that are waterproof, sturdy, but don’t make you feel like you have lead weights on your feet. With both pairs of boots, try walking a little (most hiking shops have incline platforms so you can see how the boots feel going up and down a slope), and check out several different pairs and styles before making your selection. You’ll be wearing them a lot, so you want to make sure they’re right. Again, the fit is important, and you might want a few pairs of heavier hiking socks, too, but check the fit with the boots on before you buy – always a good tip. This might not be quite the answer you expected, but it covers all the eventualities you’re likely to encounter – and also gives you a spare pair, in case you need them. As a final tip, before you leave, purchase several pairs of laces – make sure they’re the right length for your boots – and have one or two in your backpack. Laces have a habit of breaking at the most inconvenient times. How to Prevent Muscle Pain and Stifness When Walking? What to Eat on 3 Peaks Walk? What Are the Rules on Wild Camping?